Activity - An activity can be defined as a process, what is done for a particular purpose. Each work package is divided into activities. Activities have to lead to the development of one or more project outputs. Application - Application is the whole package of information and documents which has to be submitted filled in or uploaded via the eMS by the Lead partner on behalf of the whole partnership within the opening and closing time of the call for proposals. Application form - One of documents to be submitted as part of the application which describes the project's aims, partnership, gives detailed information on the work plan and project costs. Administrative and eligibility assessment - First step of the application assessment process after the closure of a call for proposals. The purpose is to verify whether an application complies with the administrative and eligibility criteria established by the Programme. Applicant - An organisation which is applying for funding. Assessment - One part of the project selection process. It implies in-depth quality assessment of the project application. Audit Authority - The Audit Authority (AA) is responsible for verifying the effective functioning of the management and control system of the Programme. AA is independent from the Managing Authority. Beneficiary - Partner receiving funds from European Regional Development Fund (ERDF). Budget line - A set of cost items that facilitates reporting on expenditure and revenue. Each cost item can be allocated to one budget line only, according to the nature of the cost. Call for proposals - Period of time in which applications can be submitted. Co-financing rate - The rate of Programme co-financing applied to the eligible expenditure of the project and each individual partner – 85 %. Cross-border cooperation - The collaboration across borders. The main aim is to reduce the negative effects of borders as administrative, legal and physical barriers, tackle common problems, and exploit untapped potential. Cultural heritage and cultural resources - Cultural heritage is composed of tangible heritage including buildings and historic places, monuments, etc. and intangible cultural heritage which refers to practices, representations, expressions, knowledge, skills, etc. Ecosystem - An ecosystem is a dynamic complex of plant, animal, and microorganism communities and the non-living environment, interacting as a functional unit. Humans are an integral part of ecosystems. Eligibility of expenditure - The criteria for eligibility of expenditure determine whether a cost qualifies for funding under the Programme. Eligibility period - A timeframe during which project expenditure must be incurred and paid in order to qualify for reimbursement from the Programme funds. Eligible costs - Costs that are in line with the eligibility rules set out by the Programme and that in consequence can be funded by it. Electronic Monitoring System (eMS) - An electronic Monitoring System which enables the submission of applications, reporting, submission of requests for changes, as well as any other communication regarding project and Programme implementation and monitoring between Programme bodies and beneficiaries. Environmental protection - Any activity that maintains the balance of the environment by preventing contamination and the deterioration of the natural resources. Equipment - Equipment is a tool, device, instrument, software, etc. purchased, rented or leased by a beneficiary, essential for the implementation of the project. ERDF - European Regional Development Fund. An EU fund which is intended to help reduce imbalances between regions of the Community. The Fund was set up in 1975, and grants financial assistance for development projects in the poorer regions. In terms of financial resources, the ERDF is by far the largest of the EU's Structural Funds. The main aim of the ERDF is to overcome the structural deficiencies of the poorer regions in order to overcome the gap between these regions and the richer ones. Europe 2020 strategy - Europe 2020 is the EU’s ten-year strategy for smart, sustainable and inclusive growth. In order to deliver on this objective, five ambitious targets have been set, covering employment, research and development, climate change and energy sustainability, education, and the fight against poverty and social exclusion. Cohesion policy is committed to supporting the Europe 2020 Strategy financially. This is why, in the 2014-2020 programming period, funding is targeted on 11 thematic objectives that address the Europe 2020 goals. Cohesion policy funding is spent in a way that helps Europe become more innovative, efficient, sustainable, and competitive. European Territorial Cooperation (ETC) - European Territorial Cooperation, better known as “Interreg”, is one of the two goals of cohesion policy and provides a framework for the implementation of joint actions and policy exchanges between national, regional and local actors from different Member States. The overarching objective of European Territorial Cooperation is to promote a harmonious economic, social and territorial development of the Union as a whole. Financial control - Bodies in Latvia and Lithuania responsible for verification on the basis of partner reports that the co-financed products and services have been delivered, expenditure declared by the project partners has been paid out and that it complies with applicable legal framework and the Programme. In Latvia FC is centralized and its functions are carried out by the Ministry of Environmental Protection and Regional Development of the Republic of Latvia. In Lithuania a decentralized system is established by the Ministry of the Interior of the Republic of Lithuania. Flat rate - One of the simplified cost options. Specific categories of eligible costs which are clearly identified in advance are calculated by applying a percentage fixed ex-ante to one or several other categories of eligible costs. Flat rates involve approximations of costs and are defined based on fair, equitable and verifiable calculation methods. Horizontal principle - Horizontal principles, in the context of EU funded work, are core principles of importance that cut across and have relevance to all areas of the work of EU funded projects. There are three EU horizontal principles: sustainable development, equal opportunities and non-discrimination, and equality between men and women. Indicator - An indicator can be defined as a way of measuring an objective to be met, a resource committed, an effect obtained, a gauge of quality or a context variable. An indicator should be made up by a definition. Joint development - The project idea and scope are jointly developed by the partners. Joint development is one of the four cooperation criteria: joint development, joint financing, joint implementation, and joint staffing. Joint financing - All partners contribute financially to the project resources. Joint financing is one of the four cooperation criteria: joint development, joint financing, joint implementation, and joint staffing. Joint implementation - The activities, the outputs and results are jointly developed by the partners. Joint implementation is one of the four cooperation criteria: joint development, joint financing, joint implementation, and joint staffing. Joint secretariat (JS) - Main contact point for the applicants, Lead partner and project partners providing daily assistance during the preparation and implementation of projects. The JS also carries out project assessment, monitoring and is responsible for the Programme promotion. At the same time the JS assists the MA and the MC in performing their functions. Functions of the JS are carried out by the Ministry of Environmental Protection and Regional Development of the Republic of Latvia. Joint staffing - All partners assume the necessary role to coordinate and take part of the responsibility. Joint staffing is one of the four cooperation criteria: joint development, joint financing, joint implementation, and joint staffing. Lead partner (LP) - Project participant taking the overall responsibility for the development and the implementation of a project. Each Lead partner is expected to conclude the Partnership Agreement (with its project partners) and the Subsidy Contract (with the Managing Authority), ensure a sound transnational project management as well as the project implementation, an efficient exchange of information among the partnership and with the Programme bodies, and the reception of the reimbursements by the partners in full and as quickly as possible. Managing Authority (MA) - The MA is responsible for managing and implementing the operational Programme in accordance with the principle of sound financial management. It is the entity that signs the subsidy contracts with the Lead partners. The MA support the work of the Monitoring Committee and the transmission of the information it requires to carry out its tasks, in particular data relating to the progress of the cooperation Programme in achieving its objectives, financial data and data relating to indicators and milestones. Monitoring Committee (MC) - The Monitoring Committee is in charge of the efficient and qualitative implementation of the Programme and progress made towards achieving its objectives. It is responsible for the project selection and major modifications of the projects. National Authority (NA) - National Authoritities responsible for coordination of implementation of the Programme on behalf of the Member States. 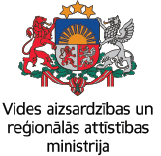 Functions of the NAs are carried out by the Ministry of the Interior of the Republic of Lithuania and the Ministry of Environmental Protection and Regional Development of the Republic of Latvia. National co-financing - Counterpart to Programme co-financing secured by the project partners as own contribution – 15 %. Natura 2000 - Natura 2000 is a network of core breeding and resting sites for rare and threatened species, and some rare natural habitat types which are protected in their own right. It stretches across all 28 EU countries, both on land and at sea. The aim of the network is to ensure the long-term survival of Europe's most valuable and threatened species and habitats, listed under both the Birds Directive and the Habitats Directive. Natural heritage and resources - As natural heritage are considered natural features, geological and physiographical formations (including habitats) and natural sites or precisely delineated natural areas. Natural resources are produced by nature, commonly subdivided into non - renewable resources, such as minerals and fossil fuels, and renewable natural resources that propagate or sustain life and are naturally self-renewing when properly managed, including plants and animals, as well as soil and water. Net revenue - Cash in-flows directly paid by users for the goods or services provided by the project, such as charges borne directly by users for the use of infrastructure, sale or rent of land or buildings, or payments for services less any operating costs and replacement costs of short-life equipment incurred during the corresponding period. Non-governmental organisation (NGO) - Within the framework of the Programme NGOs include associations and foundations as well as other legal bodies that have been established for the specific purpose of meeting the needs of the general interest and not having an industrial or commercial character and having a legal personality. Partner declaration - A statement signed by each project partner confirming their awareness of Programme rules and requirements, and that they are familiar with what they are committing to. Partnership agreement - In order to secure the quality of the implementation of the project, as well as the satisfactory achievement of its goals, the Lead partner and the partners have to conclude a Partnership Agreement using the template provided by the Programme containing all duties and responsibilities of each project partner before, during and after the project implementation. Partner report - A document comprising expenditure and activity description of each project partner which must be submitted within two weeks after end of reporting period by each project partner to the financial controller. After being certified by financial controller it serves as an input source for the Lead partner in preparation of the progress report. Pilot action - A pilot action means the implementation of schemes of an experimental nature to test, evaluate and/or demonstrate its feasibility with the aim to capitalise on those results and transfer practices to other institutions and territories. Preparation costs - Costs borne by project partners when carrying out activities directly linked to preparation of the project (organisation of meetings for development of project idea, translation of the application form, preparation of the technical documentation). Programme language - The language to be used in all communication between the applicants/beneficiaries and the Programme bodies. In the framework of the Programme the official language is English. Programme Manual - The Programme Manual is intended to assist applicants in drafting applications, as well as in implementing and finalising the approved projects. Programme Priority Axis - Area of thematic intervention defined in the Programme. Programme has selected four priority axes for the 2014-2020 programming period: -	Priority Axis 1: Sustainable and clean environment through cooperation. -	Priority Axis 2: Improvement of labour mobility and employment. -	Priority Axis 3: Social inclusion as a precondition of territorial development. -	Priority Axis 4: Improved quality of living through efficient public services and administration. Programme specific objective - Sub-area of thematic intervention defined by the programme. Programme has selected eight specific objectives for the 2014-2020 programming period: 1)	To increase number of visitors to the Programme area through improving and developing cultural and natural heritage objects, services and products. 2)	To increase integration and efficiency of environmental resource management. 3)	To regenerate public areas with environmental problems. 4)	To create employment opportunities through entrepreneurship support. 5)	To increase job opportunities by improving mobility and workforce skills. 6)	To improve accessibility and efficiency of social services. 7)	To improve living conditions in deprived communities and territories. 8)	To improve efficiency of public services by strengthening capacities and cooperation between institutions. Programme result - The change sought (in the reference situation) in view of the specific objective to be achieved. Programme output indicator - Programme output indicators relate to activity. They are measured in physical or monetary units (e.g. number of organisations supported, number of improved or created business support infrastructure objects that ensure indirect business support etc.). Project change - Change of the agreed-upon project scope as defined by the approved application form. Project overall objective - It describes the strategic and long term change that the project seeks to achieve for the benefit of the target groups. Project overall objective must be in line with the Programme specific objective. Project main output - An output can be defined as what comes out of an activity, what is produced. Project main outputs are the outcomes obtained following the implementation of project activities. Each main output should be captured by a programme output indicator and should directly contribute to the achievement of the project result. Project partner - Partner organisation involved in the project implementation. Project result - The immediate advantage of carrying out the project, telling about the benefit of using the project main outputs. It should indicate the change the project is aiming for. Progress report - A regular report presented by the Lead Partner comprising the Activity Report and the Financial Report. It documents the progress of the project and, once approved, serves as a payment request towards the Programme. Project specific objective - It shows direct contribution to the project overall objective. Project can define up to three project specific objectives. It should be possible, at least to some extent, to measure achievement of project specific objectives with project main outputs. Protected area - A protected area is a clearly defined geographical space, recognised, dedicated and managed, through legal or other effective means, to achieve the long term conservation of nature with associated ecosystem services and cultural values. Public building - Building owned or managed by a public authority (e.g. offices, leisure centres, museums, public housing, etc.). Public procurement - Public procurement contracts cover supplies, services and works. Public procurements over a certain value are subject to EU, national and Programme rules and procedures that aim to secure transparent and fair conditions for competing on the common market. Quality assessment criteria - A group of related assessment questions on which a judgment or decision whether the project should be funded will be based. Real costs - Expenditure actually incurred and paid and supported by invoices or other documents of equivalent probative value. Reporting period - A designated period of time during the project lifetime; activities carried out and expenditure incurred and paid during a reporting period are presented in a Progress Report, and are subject to Programme co-financing. Stakeholder - Anyone, internal or external to an organisation, who has an interest in a project or will be affected by its outputs and results. State aid - Any aid granted by a Member State or through State resources in any form whatsoever which distorts or threatens to distort competition by favouring certain undertakings or the production or certain goods. Subsidy contract - Grant agreement between the Programme Managing Authority and the Lead partner of an approved project. Sustainability - Sustainability is the ability to carry out an activity without significant deterioration of the environment and depletion of natural resources on which human well-being depends. Sustainable development - The concept of sustainable development refers to a form of economic growth which satisfies society's needs in terms of well-being in the short, medium and – above all – long terms. It is founded on the assumption that development must meet today's needs without jeopardising the prospects of future generations. In practical terms, it means creating the conditions for long-term economic development with due respect of the environment. Sustainable growth - Sustainable growth consists in promoting a more resource-efficient, competitive and greener economy. Sustainable tourism - Tourism that takes full account of its current and future economic, social and environmental impacts, addressing the needs of visitors, the industry, the environment and host communities. Target group - Individuals and/or organisations directly positively affected by the project outputs. Not necessarily receiving a financial grant and even not directly involved in the project, the target groups may exploit project outputs for their own benefit. Total budget - The total budget of a project established based on the costs planned by all project partners in the application form. Total eligible budget - Total budget of a project subject to Programme co-financing. In the application form, it is calculated based on the total budget, excluding the potential net revenue of the project. Transferability - Transferability refers to the degree to which the project main outputs can be applicable and replicable by other organisations/regions/countries outside of the project partnership. Work package (WP) - A group of activities defined in the work plan. Work plan - A work plan describes a project to be accomplished and outlines how it will be done. It identifies main outputs, work packages, activities and deliverables.